The Aegean Sea is located at the south-eastern corner of EU Member States’ boundaries. It is unique basin in the Mediterranean system that contains thousands of large and small islands. The Aegean Sea is one of the four major basins of the Eastern Mediterranean Sea, covering an area of 240,000 km2. Its coastline is very irregular and its topographic structure very complicated. There are over 3,000 islands of various sizes scattered all over the basin. Three deep basins exist: the North Aegean Trough oriented in the WSW-ENE direction (including the N. Sporades, Athos, Limnos and Saros basins) in the northern Aegean with maximum depths up to 1,500 m, the Chios basin in the central Aegean with maximum depth of 1,100 m, and the Cretan basin in the southern Aegean, which is the largest and deepest one, with maximum depths of 2,500 m. The Chios basin is bounded to the south by the extensive Cyclades plateau and sills (with depths that do not exceed the 350 m), which is identified in the literature as the limit between the north and southAegean. The waters of the Aegean Sea and adjacent waters bounded by a line commencing on the southern coast of Greece on the Peloponnese at 23°00′ east longitude running due south to 34°00′ north latitude; thence due east to 29°00′ east longitude; thence due north to the coast of Turkey; thence following the western coast of Turkey to Kumkale at 40°00’N latitude, 26°13’E longitude; thence along a rhumb line across the Dardanelles running from Kumkale to Cape Sedulbahir at 40°02’N latitude 26°12’E longitude; thence following the coasts of Turkey and Greece to the starting point (www.fao.org/fishery/area/Area37/en). General Fisheries Council of Mediterranean (GFCM) has amended its resolution GFCM/31/2007/2 by resolution of GFCM/33/2009/2 and established 31 Geographical Sub-Areas (GSAs) for statistical purpose. The Aegean Sea is defined as a Geographical Sub-Area 22. FAO has also defined Aegean Sea as Division 3.1 of Eastern Mediterranean Sea Subarea 37.3 in Area 37 which refers the Mediterranean and Black as one of the worlds Major Fishing Areas. Starting with Greek and Minoan civilizations Bronze Age around the Aegean Sea were two of the significant highly developed cultures in this basin. 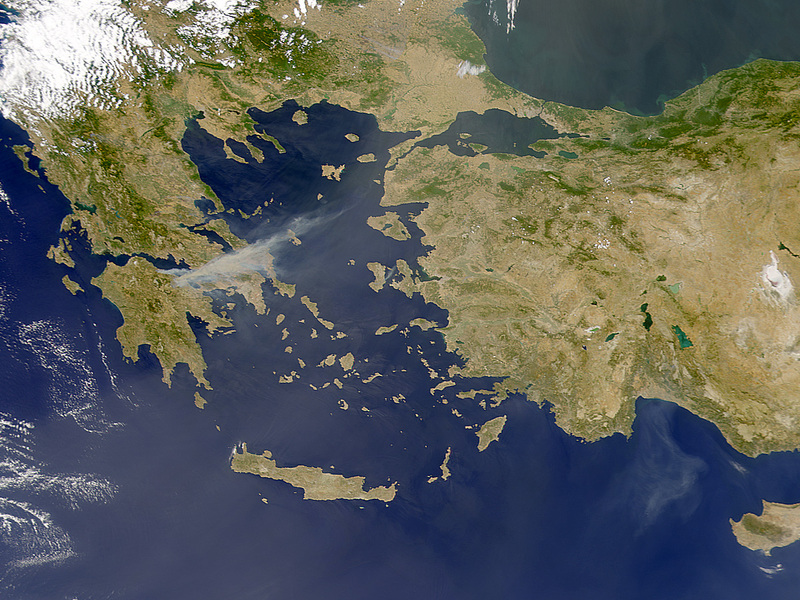 The numerous islands scattered in Aegean sea were very important to the ancient world, being the sites of key trading ports and early civilizations that had contact with Cairo to the south, Phoenicia to the east and mainland Greek cities to the north. Today, their importance is mainly dependent to the tourism activities, including yachting and diving. Consequently the Aegean coasts are functional and attractive habitats for populated human settlements, due mainly for sea related economic sectors such as maritime transportation, fishing and tourism with related recreational activities. The most prominent pressures are maritime transportation, in particular those vessels transiting forward and backward to/from Black Sea and Sea of Marmara, and human occupation of coastal zones for tourism, secondary housing, and recreational activities. The former has reflected in data records of a recent study on the risk posed by shipping in the Aegean Sea , as over 35.000 vessels per year traversing through three main route which coincides more than 100 vessels per day. The latter has an exponentially increasing trend by causing rapid development in small rural sites which have been converted to municipalities without sufficient infrastructure and well-designed development plans. Considering the facts that there are 800.000 yachts sailing in the Mediterranean with an annual increment rate of 50.000-60.000 yachts per year, and Aegean Sea is one of the most popular sailing sites, the pressure caused by yachting can quantitatively be imagined.